Showing results for tags '75mm'. Summilux-M 75mm – What can I expect? I have recently got my 75mm Summilux back from service because of back focusing. It is a bit better, but still far from perfect. At a distance of one meter, the focus is very good. But at three meters the focus is about 10 cm behind. And the back focusing increases even more at longer distances. Is this a well known problem for this lens? Shouldn't it be possible to get a better result, or is a visoflex the only safe alternative for accurate focus? I will mainly use this lens wide open. Would it be easier to calibrate it for f/1.4 only, instad of all apertures? Do I have to pay for another service if I am not satisfied? Wegen eines Sehfehlers, der das Fokussieren erschwerte, habe ich mich leider von der Leica M verabschieden müssen. Nun biete ich hier ein sehr gut erhaltenes Apo-Summicron an, das lediglich an der Sonnenblende winzige Gebrauchsspuren aufweist. Die Linsen sind sauber und frei von Kratzern. Die OVP ist vorhanden. Das Objektiv mit der Nr. 4077296 wurde im Juli 2016 vom Customer-Service überprüft, gereinigt und abgestimmt. This interesting new offering from Meyer-Optik Goerlitz of Germany will hit the market in May of this year and will be Leica M mount compatible. I am looking forward to seeing some test shots made with this lens. I have recently purchased a used 75mm Summilux f/1.4 which has an issue with back focusing. I did some tests today, and from minimum focusing distance to about 1.5 meters, the focus is very good. Then the back focusing is more and more visible at longer distances. At 2 meters the focus is about 5 cm behind, and at 3 meters it back focuses maybe 30 cm. I can't see any difference at different apertures. What is the best thing to do? Send it to Leica for an adjustment? Do they need the camera as well? (hope not). Or should I just find a way to live with it, e.g. try to remember how much nearer I have to focus at different distances? I have planned to buy a Visoflex, but currently I can't afford it. hi all! I have 35 and 75, both lux. but some times I would like to get picture quality as at my 35 lux. 75 bit different. looking at 90/2.8, 90/2, 90/2AA... I shoot landscapes, portraits. not sure but maybe 180/2.8 or 180/2.8 APO as I also wanted something longer than short tele. use these at typ 240 and Sony a7II. any ideas? 90 2.5 Summarit vs. 90 2.8 Elmarit ? Is it just me? Or does the color cast on some lenses change as you stop them down? Here is an example of a shot taken with a 75mm Summicron Apochromat wide open and at f/5.6. The white balance was set manually in Lightroom using the exact same temperature and tint settings for both. The images were taken only a couple seconds apart, so I know the lighting didn't shift. Both images are cropped to, roughly, the central ⅔ of the original image. The image taken at f/5.6 has much stronger magenta tones than the image taken at f/2. I see the same thing with my 50mm Summilux Asphere (though to a lesser extent--mostly the Summilux is just a bit warmer than my other lenses at all apertures). Has anyone else noticed a shifting color cast with aperture? It's not a big deal for my photography since I tend to leave white balance set to automatic in the camera and adjust in software after the fact using RAW files only, but it surprised me nevertheless. I don't recall seeing this mentioned in this or other forums. If it makes a difference, RAW conversion was done using Lightroom 4.4 using the embedded profile (my preference over the Adobe Standard profile which, on average, produces less consistent results). No sharpening or any other adjustments aside from cropping to the frame size and applying the same white balance settings to both images. - Jared p.s. Obviously these aren't intended to be interesting photographs--I'm just trying to learn the characteristics of my new 75mm lens and was shooting a flat subject to eliminate the effects of depth of field--was trying to get an idea of field curvature, optimum f/ stop, etc. and was surprised to see a difference in color. M8 with VC 75mm F/2.5 review and images!!! Here's another from my 75 'cron. I'm not by any means a portrait photographer but I had a willing subject and thought I'd see what I could muster up. Comments appreciated and welcomed. 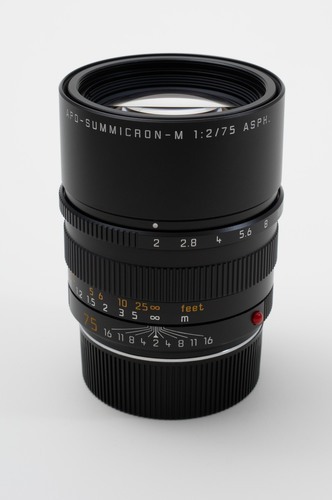 Focusing error of Summicron 75mm on Leica M9? ?